If you're part of the global mobility ecosystem—or would like to be—get ready for a sea change that extends far beyond trends in the automotive industry. What will the future of mobility look like for you? We recommend starting with the two articles on the right to learn more about the key trends that are driving the tuture of mobility. 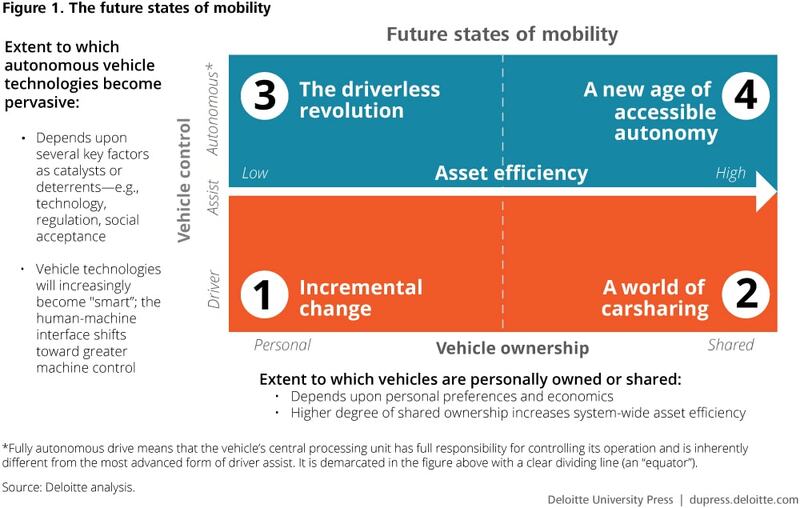 These key pieces lay out Deloitte's overarching future of mobility perspective. The future of mobility: How transportation technology and social trends are creating a new business ecosystem. The future of mobility: What's next? Tomorrow's mobility ecosystem—and how to succeed in it. Across the ecosystem, from auto retailers to insurance to finance, businesses are watching automotive industry trends and realigning to remain competitive and viable as the future of mobility unfolds. Companies that are preparing now—deciding where to play, transforming operations, implementing new technology, refocusing talent and marketing—will be well positioned to win. The entire way we travel from point A to point B is changing, creating a new ecosystem of personal mobility. The many impacted industries should reconsider how they create value in this emerging environment.